Lately, I keep on seeing this beautiful icon of Christ! And it’s such a beautiful image with so much history in meaning stuffed in it that I couldn’t help but feature it! 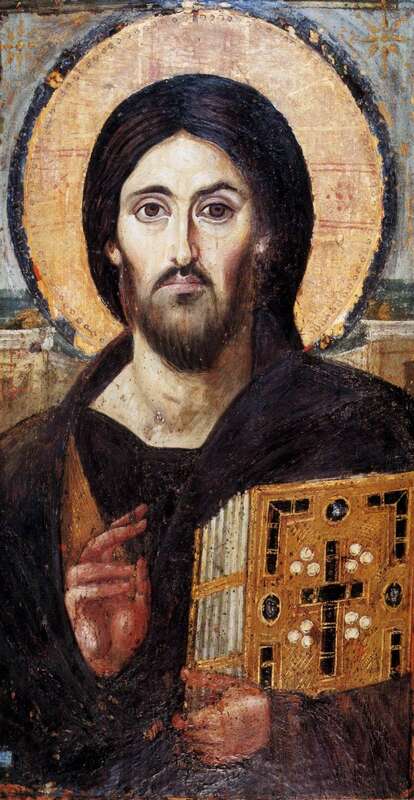 Christ Pantocrator, 6th century. St. Catherine’s Monastery, Sinai, Egypt. First of all, it’s one of the oldest images of Christ that has survived over the years — scholars estimate that it was originally made in the sixth century. Which is quite remarkable, considering that during the seventh and eighth centuries, there was a huge iconoclastic movement (iconoclasm literally means, “icon smashing”) so not many images of Jesus exist before this time! And, being made in the sixth century, the icon reflects some of the concerns and growing pains that the early church was going through at the time. In the fifth century, there were several large schisms and heresies that were commonly believed in — one of which was propagated by a Bishop, named Nestorius, known as Nestorianism. First, what we actually believe: we believe that Jesus Christ is 100% God and 100% human. He has two distinct natures that are united together in the person of Christ in a mysterious way that we do not totally understand which happened at the very moment of conception. So, what is Nestorianism? Basically, the idea behind the heresy is thus: Christ has both a distinct divine and a distinct human nature. But, the divine nature didn’t come until after Jesus was born. So, therefore, Mary, the Mother of Jesus, could not be the Mother of God, since she didn’t carry the divine Christ in her womb. She only carried the human nature of Christ in her womb. The Church (rightly!) condemned this as a heresy in the Council of Ephesus and proclaimed that Mary was indeed the Mother of God since she held Jesus — with both His human and divine natures — in her womb. But then, this heresy gave way to yet another heresy! This heresy was called Monophysitism — basically, the idea that Jesus Christ had only one nature that was a mix of the human and divine. However! This was also heretical because, if Christ were not fully divine, then He absolutely could not be God. So, as you can imagine, there was a lot of discussion around these times of the dual natures of Christ and how He was both God and man simultaneously in one body! 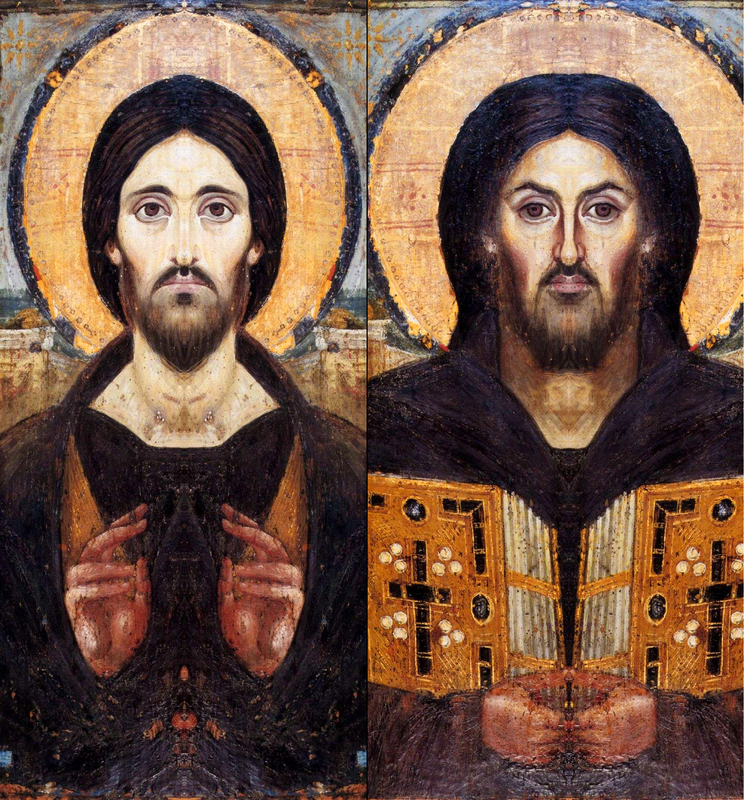 Mirrored composites of left and right sides of the icon, Christ Pantocrator, 6th century. St. Catherine’s Monastery, Sinai, Egypt. The left side is supposed to represent the humanity of Christ. His hand is raised in a symbolic gesture of blessing while His eye seems to look on sympathetically. In this way, He is supposed to represent the mercy of God — after all in Christ, we may find mercy! The right side is supposed to represent the divinity of Christ. Christ holds the bible in His hand to represent the Law and Justice of God while His eye looks on hard at the world. After all, Christ was not afraid of reminding people to repent from their sin. So, this represents Christ as judge. His two natures combined to show the distinct persons of God, united in one! Which side of Christ are you more drawn to when looking at this icon? The left side or the right side? Why? How does Christ’s humanity speak to you and affect you in your spiritual life? How about Christ’s divinity? How does that affect you in your spiritual life? Help us trust in You and see You as You are — both as merciful advocate and powerful judge. Be merciful with us sinners. This is one of the images I chose for the Luminous Mysteries, which is the second book of the Illustrated Rosary series. That book will be published sometime in 2018! You can purchase the first book, The Joyful Mysteries, today. Click here for more details! Terrific post! Where did you research this information? Thank you.